StumbleUpon is a very nice place for readers who want to read good blogs articles related to their interest. They can like/dislike and stumble those articles. There is also option of comment on and share those posts. For bloggers it’s a good place to share their blog posts and generate traffic to their website. More traffic will increase revenue if you are showing ads on that website, for example ads from Google AdSense. Login or register on StumbleUpon if you haven’t already. Now go and click on your small profile picture in the top right corner of the page. A menu will appear just below your picture. Select Add a page option and fill the information it asks for. Give the blog address you want to share and click submit. 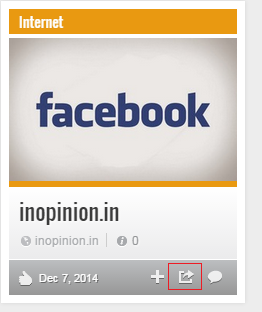 When you click “Add This Page” button , your Blog article will be submitted to StumbleUpon and a new page will open. It will show StumbleUpon confirmation message that your blog post has been successfully added. Now it’s turn of sharing this blog post. Click on the Your Likes link on the confirmation page if you are still on that page or go to “My Likes” option from the menu (same menu where you find “Add A Page” option). Here you’ll find your recently added blog post on the very top of all your likes. Click on the share button. 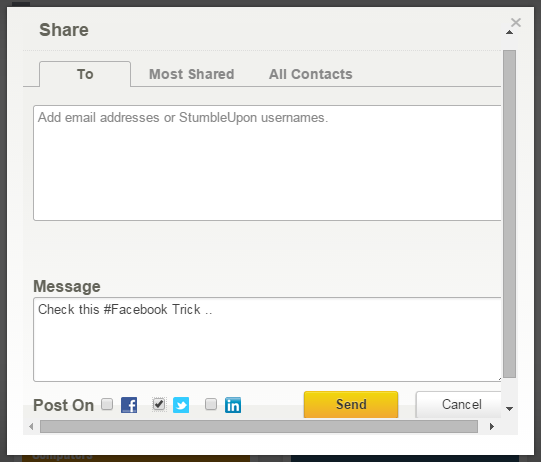 A popup box will appear and it will show you options on sharing your content on other social media platform. Write a short note about that blog ( be sure it’s less than 140 characters if you are going to share it on twitter also) and click on the social media options where you want to share your blog, and click Send. You can check on your selected social media. They will your shared blog and also a short link using su.pr of your blog post URL. That’s you have to do now, wait and watch your blog’s increasing traffic. StumbleUpon will show your blog post to different users randomly and they will like or maybe dislike, based on what you have written in that post, and stumble your blog post. On your end be an active user on StumbleUpon. Read other peoples post, comment on those posts and stumble and like/dislike if you like or dislike them.Always remember “Content is the King”. People started using Stumbleupon because of their url shortening service su.pr. But now it’s under maintenance and i don’t think that they are ever going to start it. how ever Stumbleupon is still driving traffic to blogs and bloggers are using it.